Junk these habits before it's too late! (SPOT.ph)In our quest to give our skin the TLC it deserves, sometimes we end up doing more harm than good. Given the seemingly endless stream of beauty blogs, websites, and Youtube channels out there, it’s no wonder we can barely tell fact from fiction anymore when it comes to proper skincare practices. MYTH: Natural ingredients are always better for your skin. FACT: Going ‘organic’ might be trendy nowadays but that doesn’t necessarily mean it’s better for you. Most of the time, these ingredients are only effective and safe for use because they get processed and diluted before they’re ready to be sold. MYTH: Makeup can cause breakouts. FACT: It’s not your makeup that's causing you to wake up with zits: it's you not properly taking off the war paint before going to bed. Water and regular soap usually aren’t that successful at removing a lot of products, so don’t think your makeup will just wash off in the shower. MYTH: Tingling and burning sensations mean the product is working. FACT: Actually, it means that the product you’re using is too harsh for you and your skin is getting irritated. Wash it off immediately and switch to something milder ASAP! MYTH: You don’t need to use sunscreen when it’s not sunny. FACT: Unfortunately, the sun's UV rays can still make your skin miserable even on the cloudiest, gloomiest days. Trust us, SPF is your BFF! MYTH: Anti-aging products are only for old people. FACT: Keeping your skin healthy and fresh is a lifelong endeavor, so start as early as possible. The ideal time to start using anti-aging products is in your 20’s ,when the aging process really starts cranking up. MYTH: Shaving your body hair makes it grow back thicker. FACT: What’s actually happening is that when you shave, the tips of your hair become blunt, making them feel coarser to the touch and seemingly thicker. MYTH: Toothpaste is a quick and cheap way to treat pimples. FACT: The menthol in toothpaste might actually worsen the problem, triggering inflammation, itching, and possibly more flare-ups. Battle acne the right way by investing in real zit-zapping cream. MYTH: Slather on as much moisturizer as possible to avoid dry skin. FACT: Layering on the creams and gels will just make it harder for your skin to absorb the nourishing products. Not to mention, you’ll also become more prone to breakouts if you live in humid regions (like the Philippines!). MYTH: If you have oily skin, you don’t need to moisturize. FACT: Moisturizers are there to retain a healthy amount of water and oil on your face. If the balance goes out of whack, your skin might actually start producing more oil and you’ll be shinier (or even pimplier!) than ever! MYTH: Exfoliate everyday to make your skin glow! FACT: While you should do this regularly to get rid of dead skin cells, overdoing it will only irritate your skin and make it more vulnerable to bacteria and pollution. Stick to once or twice a week. MYTH: Take a bath and wash your face as often as possible to hydrate your skin. FACT: While we all love the idea of jumping in the shower after a day of sweating it out, washing too often will actually strip your skin of its natural oils, making it drier. Guzzle down lots of water instead—that's way more effective! FACT: Sorry to say, but if you’re naturally acne-prone, you’ll always be acne-prone (yes, you can still get zits even in your 40s!). Acne can also be caused by hormone imbalances, so even if you had clear skin as a kid, you still might breakout as an adult. MYTH: Popping your pimples helps get rid of acne. FACT: Similar to the disastrous results of the DIY toothpaste treatment, squeezing your zits will just spread the original infection. MYTH: You can just scrub away blackheads. FACT: Blackheads don’t mean you're grimier than usual; rather, they appear when your pores get clogged with dirt and oil and are then exposed to air, causing the dirt to oxidize and turn black. Some rough rubbing won’t do you any good, so just use the proper products to treat them. MYTH: You need to change skincare products frequently because their effects will stop once your skin adapts. FACT: When you start using good skincare products, you often see immediate changes. Maintaining this regimen just means your skin will settle into a healthier state and you won’t see such dramatic effects on your face anymore because there’s little to no damage left to fix. In the end, you're the only one responsible for keeping your skin healthy and young-looking. 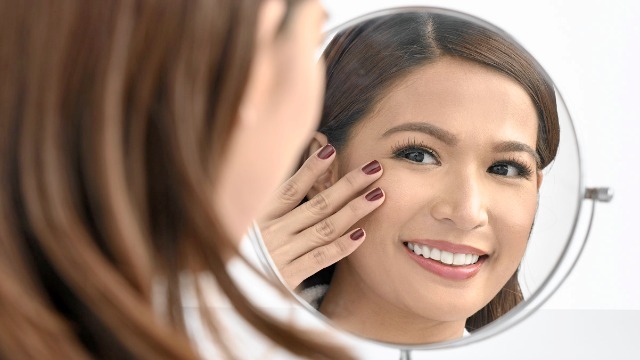 There’s no one way that works for everybody, so while you’re still figuring out the perfect regimen for yourself, you might as well take your skincare game up a notch and consult with the dermatologists at Flawless, one of the country’s preferred skincare clinics. 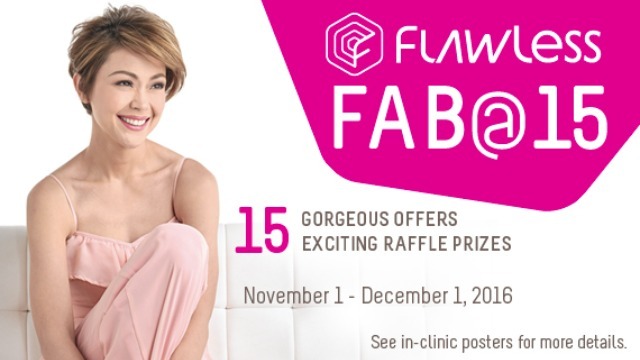 There's really no better time than now to schedule a visit: they're celebrating their 15th anniversary with FAB@15, a two-part nationwide promo guaranteed to have you rushing to the nearest Flawless clinic. Here’s how it goes: Flawless will be releasing special vouchers that you can use to avail one of their 15 different offers, which include free products, complimentary service upgrades, and savings up to P52,500. Each voucher used then gets you a raffle entry that might win you exciting prizes like a scooter, gadgets, P15,000 worth of shopping gift cards, and more. The vouchers will be available for free from November 1 until December 31, while the raffle draw will be on January 14, 2017, so hurry up! Don’t miss this chance to get quality skincare and beauty treatments and exciting prizes that will surely make your fabulous life even better. Visit a Flawless clinic near you to find out more or book your Flawless session now through their website! This article was created by Summit Storylabs in partnership with Flawless.